Google has just announced their freshness update, something I have claimed right here on SEO Cowboy for over 2 years…. now it is just official. Fresh Content Marketing has been a key SEO strategy for all my clients since I coined the phrase in August of 2009. What Does Google Say About Fresh Content? Google says: Given the incredibly fast pace at which information moves in today’s world, the most recent information can be from the last week, day or even minute, and depending on the search terms, the algorithm needs to be able to figure out if a result from a week ago about a TV show is recent, or if a result from a week ago about breaking news is too old. So basically having the latest, freshest content will not automatically help you in the search results. My understanding is that if your content is a upcoming event of hot topic then indeed Google will take this into consideration to determine ranking. Most recent events will have an advantage over last years events and trending topics and hot news will have an advantage over old news. Is this update in SA Yet? I would have to say yes, I honestly think it has been around for quite some time even though Google has only announced it now. 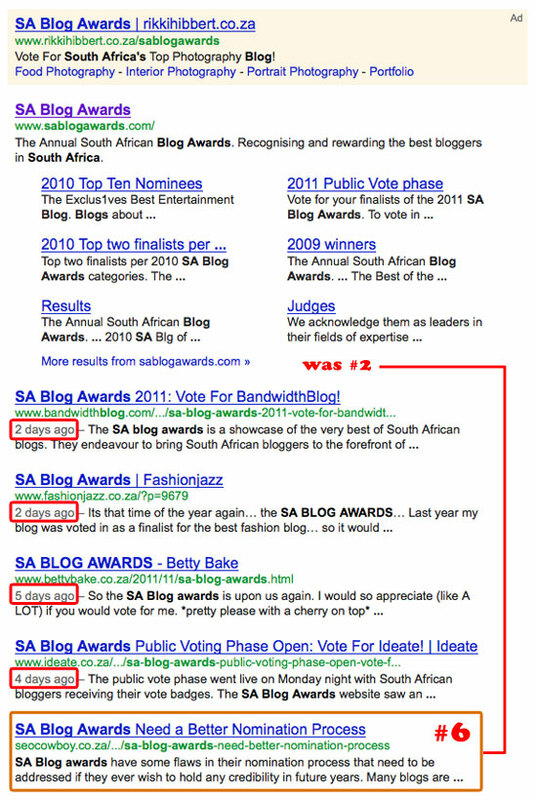 Lets take a look at the below image with search results for the SA Blog Awards. As you can see, my article about the SA Blog Awards from a few years ago has dropped below 4 of the more recent articles of this year. Google understands that the SA Blog Awards is an event therefore gives priority to the most recent instances of the event. Nobody wants to read old event news and Google knows this. Google knows that many people are finding old out-dated events in the results and are forced to use Twitter and Facebook to find the latest information. As I mentioned time and time again, don’t let your site go stale. Keep it up to date with quality content that is fresh and unique. If you are an events company or online newspaper you can be sure that Google loves your new information and will favour your site against old news. Here is a simple technique lets say your main keyword is SEO and taking the above article, I would post at least one new article per month covering the topic and as such you will stay ahead of the comp. In this case you can maybe post a new post every year with the winners and point out why you still see the system as flawed or maybe if they have improved why so. I thought the ‘freshness­’ was already part of the Google algorithm. The more updated a site (with rich content) the more relevant Google thinks it is.